How can I install this script as a folder action? I'm trying to setup a script as a folder action that will identify and change unwanted characters in the name of a file added to a target folder. The intent is to have this automation run as a folder action that should read the name of an incoming file or new folder, check for spaces and dashes, and replace them with underscores. set AppleScript's text item delimiters to "_"
This answer is self-contained as a solution to the question above. However, it also serves as a continuation to the previous question that was closed, so incorporates some of the broader requests that were wanted, such as a confirmation dialog with the option to edit the filename, and the option to ignore the validation and use a filename of the user's choice. While this script works, I should remind you of the comment I left against your original question, which has been reiterated above by another user: this script has the potential to be called twice for a single file because renaming files whilst they are inside the folder being watched triggers the folder action again. This happens when the user elects to edit the suggested filename and provides an invalid name. The script will ask for the new filename to be validated by showing the dialog a second time (so far, this is all normal, and entirely what should happen). However, when the user then selects to disregard the naming criteria and use this name anyway, the file is renamed and the script is triggered again. This brings up the dialog for a third time, which isn't what we want to be happening ideally, but is unavoidable. But, for now, I have written the script to do what you wanted. I'm assuming that there aren't going to be many instances where you will want to disregard your own naming criteria, so the "three-dialog" phenomenon may not ever arise, or be little more than irksome when it does. To install a script as a folder action, I'll direct you to the first part of my previous answer, which I've transferred in below. 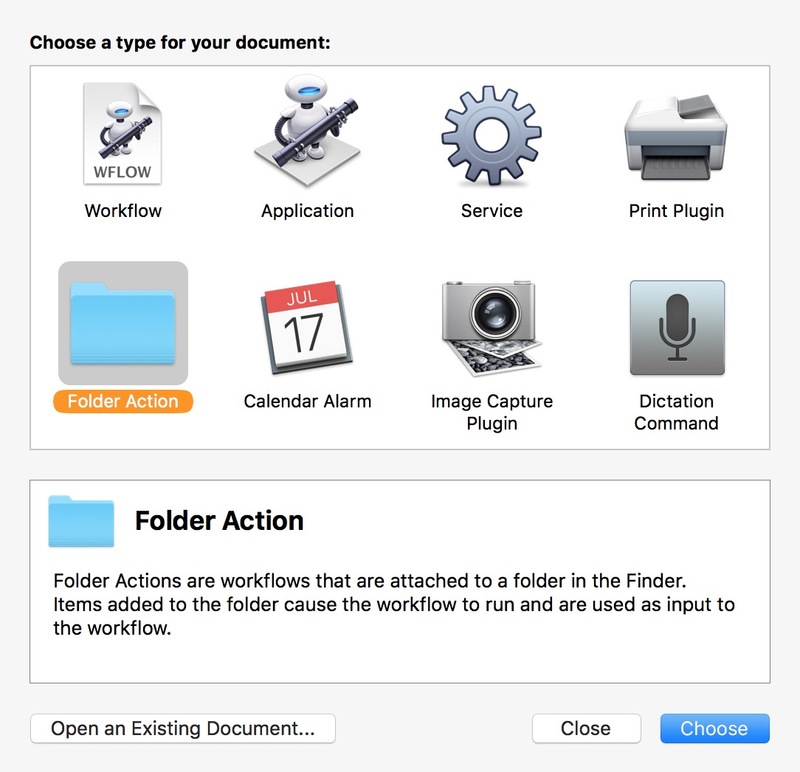 A folder action can be created in one of two ways: via Automator, or by way of a folder action script. For information on how to create a folder action script, which I would say is probably the more suitable solution in this case, you may wish to read the Mac Automation Scripting Guide - Watching Folders, which details how to do this. The section titled Attaching a Folder Action Script to a Folder is the most pertinent to the task. Not the answer you're looking for? Browse other questions tagged macos applescript automation folder-action . How can I make this script faster?